I loved the interview. 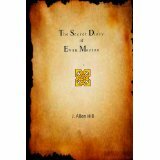 And J. Allen Hill, we’re alumni of the same university, U of L.
I met Ms. Hill at the book club get together today and was so impressed by her I bought her book, “The Secret Diary” and I am looking forward to reading it. So nice to have met you Ms. Hill. My daughter and I greatly enjoyed your book review today as well. Quite certain you will enjoy her story, Inez. Good choice. Gotta read your book first!.